Finnish scientists say workers who applied spray-on asbestos products are more likely to contract malignant mesothelioma or lung cancer than other asbestos workers. Asbestos sprayers were at the highest risk of mesothelioma and lung cancer. Occupational health experts in Finland say their new analysis of Finnish cancer data finds that a group of workers with the highest level of asbestos exposure appear to be the most likely to develop malignant mesothelioma later in life. Surviving Mesothelioma has a new article on the study. Click here to read it now. According to researchers with the Finnish Institute of Occupational Health, people who worked as asbestos sprayers had a significantly higher incidence of mesothelioma than other types of asbestos workers, including asbestos miners. The study in Safety and Health at Work found that the incidence of mesothelioma among the various groups of workers remained relatively constant during each 5-year period. 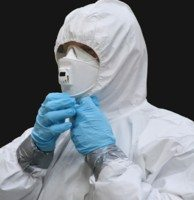 “It is not surprising that spray-on asbestos insulation raised the risk for mesothelioma so dramatically, given that inhalation of airborne asbestos fibers is the primary means by which most patients are believed to contract mesothelioma,” says Alex Strauss, Managing Editor for Surviving Mesothelioma. To read more about professionals at elevated risk for mesothelioma, see Asbestos Sprayers Face Higher Lifetime Mesothelioma Risk, now available on the Surviving Mesothelioma website.